world of wonders on pure style, at a price that represents outstanding value. of Development through Art (ODA). relaxing journey aboard the luxurious RV La Marguerite. around Tan Chau and step ashore for a rickshaw tour. and enjoy a guided tour of the spectacular Royal Palace. tour of Oudong, the former royal capital of Cambodia. morning. 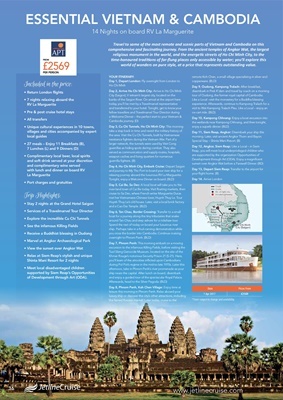 Later, visit ancient Angkor Thom and Bayon. *Tours subject to change and availability.